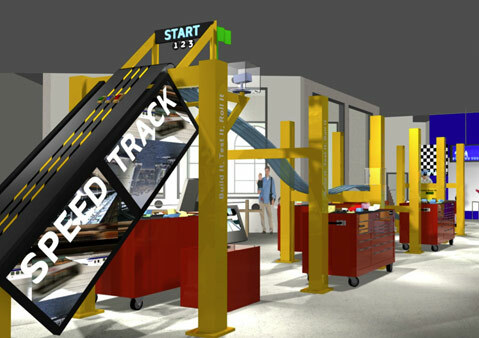 Adding engineering design to schools' science curricula moves education into the future, and exhibits like "Build It, Test It, Roll It," a speed track envisioned for the Children's Museum of Santa Barbara, will give children a chance to practice those skills. When thinking about education, we need to anticipate how children will ultimately use what we teach them. The kindergartners of next fall are the college Class of 2031. This means that elementary school teachers must help them develop the skills they need to live and work in the 2030s and beyond, a future we cannot yet fathom. We already have more information at our fingertips than any one person can hope to learn in a lifetime. In the face of such an information-rich environment, it is less important that children memorize facts and data and more important that they are able to create new knowledge, evaluate ideas and information, and use information flexibly to solve new problems. They need to be able to innovate. The new K-12 standards were designed to help children develop 21st-century skills, including innovation and creativity. Along with the Common Core standards for math and literacy, there is also a new set of standards for science. The Next Generation Science Standards (NGSS) were adopted by California in September and will affect science instruction just as the Common Core is already impacting math and literacy instruction. • Define a simple design problem reflecting a need or a want that includes specified criteria for success and constraints on materials, time, or cost. • Generate and compare multiple possible solutions to a problem based on how well each is likely to meet the criteria and constraints of the problem. • Plan and carry out fair tests in which variables are controlled and failure points are considered to identify aspects of a model or prototype that can be improved. Engineering design is new to California’s K-12 schools, and teachers and schools will need to create appropriate instruction to implement these new topics. While the Common Core and Next Generation Science Standards most directly impact schools, the burden of helping children develop the skills necessary for the 21st century goes beyond schools. Fortunately, places like museums, zoos, aquariums, and natural preserves allow children to explore science outside of school. I have been working with a group designing a new place of learning for Santa Barbara’s children. The Children’s Museum of Santa Barbara will join the numerous out-of-school resources available to our children and will fill a gap for learning physics and engineering topics, an area that challenges elementary school teachers, here and nationwide, in training, lesson plans, and materials. The Children’s Museum was in the midst of designing exhibits and considering how visitors would interact with them just as the Next Generation standards were being developed. This provided unexpected opportunities to design learning experiences and exhibits from the ground up with the new standards in mind and informed by research. The museum plans a significant focus on learning by building things. For example, at one exhibit, children will design and build model cars. After they place the car on a track, velocity and acceleration will be measured and displayed. Children can then rebuild the car to make it travel faster down the track. All this tinkering with materials, building, testing, and rebuilding of cars actually teaches important aspects of motion, friction, and stability, all key physical science standards, learned through the process of engineering design. Classroom teachers can take entire class sets of data back to the classroom to further students’ learning by considering trends and relationships between car shape, velocity, and acceleration. This activity engages children in all three stages of design thinking: considering the problem, imagining solutions, and iteratively developing better solutions. Field trips to Santa Barbara’s museums, colleges, gardens, and historic landmarks can serve as outstanding resources for children and teachers. Through interactive exhibits and activities and docent mentors, they help create the next generation of innovators. Danielle Harlow is an assistant professor of science education in the Gevirtz Graduate School of Education at UCSB. The Children’s Museum of Santa Barbara is slated to be completed in 2016 and will be located near the Amtrak station.